Loyalist paramilitaries in Northern Ireland have pledged to support the rule of law and expel members who engage in criminal activity. In a joint statement, the Red Hand Commando, Ulster Defence Association (UDA) and Ulster Volunteer Force (UVF) "emphatically" condemned crime. "We fully support the rule of law in all areas of life and emphatically condemn all forms of criminal activity. "We reject and repudiate as unacceptable and contrary to loyalist principles any criminal action claimed to have been undertaken in our name or attributed to any individual claiming membership of one of our organisations. "We further declare that any engagement in criminal acts by any individuals within our organisations will be regarded as placing those persons outside the memberships. "This has been collectively agreed. "We cannot allow criminals to hinder transformation and the ground in which such people stand is now shrinking." The statement, which was read out during a press conference, at the Linen Hall Library in Belfast was issued to mark the 20th anniversary of the Good Friday Agreement which largely ended decades of violence in Northern Ireland. It was the result of lengthy discussions with three Protestant church leaders. The statement continued: "Loyalists must have ownership and control of their own future. "Now is the time for a renewed loyalism, with a new impetus, to meet the challenges ahead. "We want to see a better future for all in Northern Ireland and where the residual effects of conflict are recognised and addressed in a reparative manner. "We must shape our own destiny and with the co-operation of others ensure loyalist communities are at the centre of Northern Ireland's peace and political transformation." The statement comes seven months after a new task force targeting criminal activity by all paramilitary groups in Northern Ireland became fully operational. Police Service of Northern Ireland Chief Constable George Hamilton has welcomed the loyalist commitment. In a statement, he said: "Twenty years on from the peace agreement it is disappointing that we are still in a place where there are statements about paramilitary violence and criminality. "Our communities do not want to live in fear of violence. 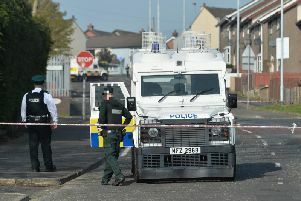 The Loyalist Community Council must support people in giving information to the police. Mr Hamilton said police would continue to pursue those involved in violence through the Paramilitary Crime Task Force.